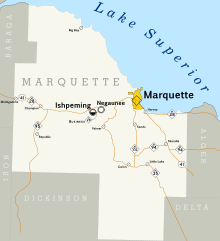 ^ Quickfacts.census.gov - Marquette County Archived 2011年7月14日, at WebCite - accessed 2011-12-06. ^ Quickfacts.census.gov - Marquette, Michigan - accessed 2011-12-06. Clarke Historical Library, Central Michigan University, Bibliography on Marquette County.